SDI relies on support and solidarity from individuals and organisations around the world to ensure that it can bring the voices of the most marginalised to the fore. Individuals and organisations are encouraged to download, read and publicise our publications. 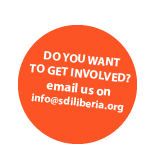 Holding an advocacy or solidarity event on any of SDI’s campaign priorities is an excellent way to increase awareness of the challenges faced by grassroots communities in Liberia, show solidarity and contribute to our advocacy efforts. Let us know if your group or organisation is advocating on an issue related to SDI’s programmes. We would be glad to support it and include it on our website’s news section. SDI also takes interns and volunteers to support specific projects. Interns have held both short and long-term positions and have provided assistance across a broad range of programme activities such as carrying out research, community outreach and mobilisation, policy development and advocacy campaigns. Professionals can also volunteer remotely and provide expertise in relevant programme areas. For more information contact the Internship and Volunteers coordinator. To support campaigns and lobbying on natural resource governance including mining, forestry, agriculture and oil and gas. To proivde facilitation and advocacy support to various project teams. To support the communications strategy involving social media, writing blogs, email bulletins and press releases. To support targeted research on social and environmental issues such as the impact of extractive industries, community rights, natural resource governance and sustainable natural resource management. To provide in-house legal expertise on concession agreements and social policy. This would include legal review of concessionaires compliance with terms of their contracts, including environmental law and regulations. To provide support in the area of organisational manangement and development.